Mogami Platinum Guitar Instrument Cables exhibit extraordinary purity and astonishing detail. Engineered for extended highs and explosive dynamics, Mogami Platinum Cables deliver all the emotion of your performance without loss, coloration, or exaggeration. Designed to be completely transparent, Mogami Platinum Guitar Instrument Cables superbly maintain the tonal signature of your original instrument and effects. No matter what your style, whichever instrument you play, Mogami Platinum is amongst the finest instrument cable ever conceived. 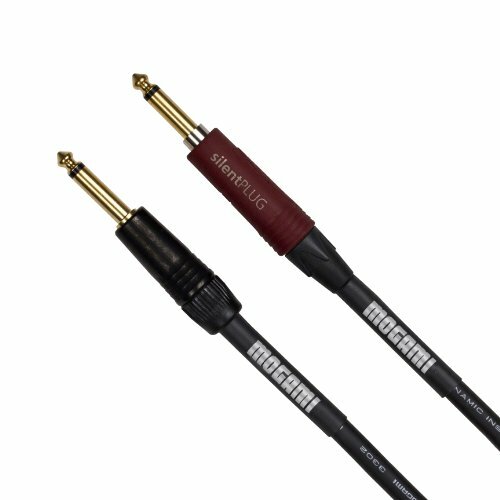 An ultra-premium cable, Mogami Platinum is excellent for use with acoustic guitar, electric guitar, bass guitar, keyboard, pedal effects, and everywhere a 1/4" instrument cable is needed. Mogami PLATINUM GUITAR Instrument Cables are equipped with dual straight connectors. Lengths of 12 foot and up feature a Neutrik silentPLUG for quiet hot-swapping between instruments. Available in 3, 6, 12, 20, 30, and 40 foot lengths. Mogami Lifetime "No Excuses" Warranty: all brand new Mogami cables include Mogami's Limited Lifetime "No Excuses" Warranty to the original purchaser and are proudly supported by Mogami and their dedicated network of Authorized Resellers. Please reference the entirety of Mogami Cable's Limited Lifetime "No Excuses" Warranty specification for complete details. Mogami Platinum Guitar Instrument Cables exhibit extraordinary purity and astonishing detail. Engineered for extended highs and explosive dynamics, Mogami Platinum Cables deliver all the emotion of your performance without loss, coloration, or exaggeration. Designed to be completely transparent, Mogami Platinum Guitar Instrument Cables superbly maintain the tonal signature of your original instrument and effects. No matter what your style, whichever instrument you play, Mogami Platinum is amongst the finest instrument cable ever conceived. An ultra-premium cable, Mogami Platinum is excellent for use with acoustic guitar, electric guitar, bass guitar, keyboard, pedal effects, and everywhere a 1/4" instrument cable is needed. Mogami PLATINUM GUITAR Instrument Cables are equipped with dual straight connectors. Lengths of 12 foot and up feature a Neutrik silentPLUG for quiet hot-swapping between instruments. Available in 3, 6, 12, 20, 30, and 40 foot lengths.